Hi Emily, tell us who you are and what lead you into microservices? I am Emily Jiang. I am Liberty Architect for MicroProfile and CDI. I am passionate on the future of microservices and very keen to set up programming model for developing cloud native microservcies. Hence, I am involved in MicroProfile, to optimise enterprise Java for microservice architect and accelerate the adoption of Cloud Native microservices. I will talk about why, what and how to secure microservices. 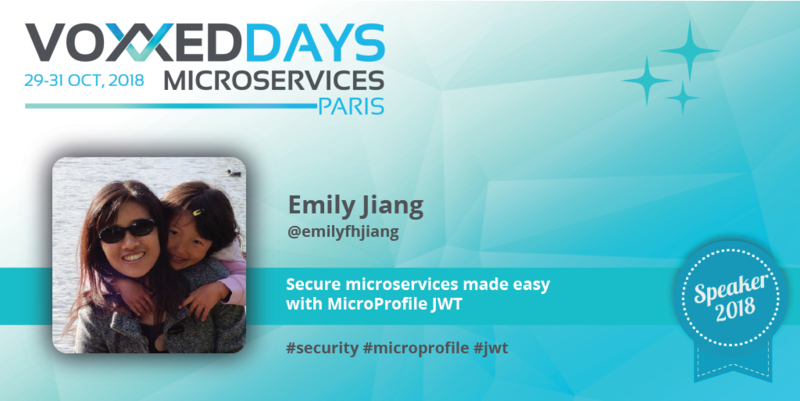 I will go in details on how to secure microservices easily using MicroProfile JWT. We can see that Microprofile is catching up with all the microservices needs (fault tolerance, health check or config). In terms of security, there is JWT, but we hear more and more about macaroons. Do you think the Microprofile will support several kind of tokens, not just JWT? It is a good question. At the moment, we are trying to focus on JWT as it is widely used. Macaroons is alternative to JWT for session management. MicroProfile is very flexible and will try to support different technologies if a use case arises. I will bring this up in the community for discussion to see whether we should support macaroons. Hope to meet many of us during this conference!